Titus’s Arch towers above us; its white marble Corinthian columns and travertine inlays gleam in the sun. It is one of those June days that makes you happy to be alive, happy to be wandering Rome. This trip, we have decided to focus only on Jewish sites. That means staying in the ghetto, wandering its tiny streets, climbing Esquiline Hill to gaze at Michelangelo’s Moses, visiting the Great Synagogue and the Jewish Museum. And that means heading to Titus’ Arch. The Arch, at the eastern most side of the Forum overlooking Palantine Hill, reminds the visitor of those sad long ago days when Titus and his soldiers returned to Rome after they had destroyed Jerusalem and the second temple. After looting as much as possible, they carried everything back to Rome along with thousands of Jewish slaves from Judea. This act in 70 CE scattered the surviving Jews into the diaspora and changed Judaism forever. Built to honor Titus and celebrate the sacking of Jerusalem, the Arch captures a moment frozen in time, etched in stone--Titus astride his chariot, chained Jewish slaves forced to carry the Temple spoils, dragging the golden menorah and table through the streets of Rome surrounded by Roman soldiers who plan to use the slaves to build the coliseum. I stand a long time trying to decide what to do. I’ve read about the Jewish traditions associated with the Arch--never walk under it, spit when you go near, be wary of the history it commemorates. But since Israel became a state, these traditions have been largely modified, if not the feelings about the Arch. The Jewish community of Rome even held a parade beneath it in May of 1948 when the state of Israel was recognized. But I’m still debating. We are with a Roman Jewish friend who explains the traditions to us. She and many of her friends are from families whose roots in Rome precede Christ, who arrived during the time of Judah Maccabee when trade between Rome and Judea flourished, before the influx of Jewish slaves. This is a small, proud community who call themselves Romanium Jews to honor their distinctive and long background with its own traditions. The foods are different, even the prayers have their own tropes called Nusach Italki. We have spent the morning looking at silver Torah ornaments, eighteenth century prayer books, ketubot in the Jewish Museum and the Great Synagogue. Even more beautiful are the Torah covers and curtains, pieced together during times when Jews were locked in the ghetto, proscribed from any work other than “shmatas” or making ball gowns for rich Roman women. The work is so fine it is hard to discern the tiny stitches piecing together the scraps that were saved and sewn into beautiful, seamless Torah covers by the community. We passed the area where two thousand Roman Jews, even after raising the gold ransom demanded by the Nazis, were rounded up and deported to Auschwitz in October, 1943. We stopped for a minute at the Jewish school, listening to children singing inside, watching as they waved from a high window. We wandered tiny ghetto streets looking up at the walk-up-seven-story buildings. The streets are dark—no light can get in between the high buildings. Jews who didn’t convert were locked into the ghetto for more than three hundred years where they were forced to build up as they could not live elsewhere. Now these tiny walk-ups are trendy homes for wealthy Italians. We have seen so much, done so much, yet here I stand beneath the Arch, still trying to decide what to do. We gaze up at the Arch towering above the Forum, the ruins and rubble. It is a reminder that the temple is gone, all the treasures stolen. It is another reminder of the traumas to the Jewish people. 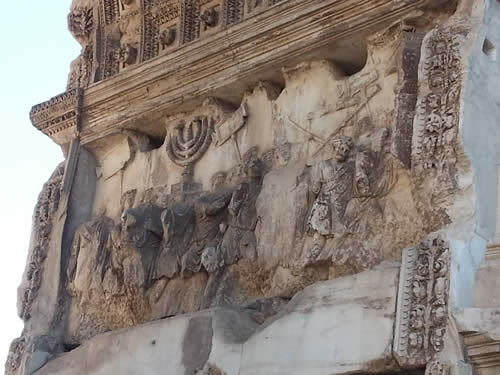 Some day maybe the golden menorah and other treasures stolen by Titus will be found, somewhere in catacombs or in Vatican vaults deep beneath the city. Unless they were smelted long ago just like the bronze on the letters commemorating this monument to Titus. I finally decide there is no need to walk under the arch. There is no need to spit. To stand here is enough. Jerusalem is a vibrant city. Israel is a flourishing country. Rome’s Great Synagogue and its Jewish Museum draw greater crowds each year as does Michelangelo’s Moses. After years of slavery at the hands of Titus; after years being locked into the ghetto without sunlight or air; after being hunted by Himmler, rounded up by the Nazis and sent to Auschwitz; after graffiti on some of Rome’s walls that is still virulently anti-Semitic; it is enough to stand here as a Jew, proud and grateful, turn and walk away.